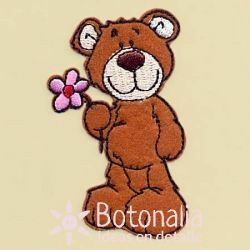 For teddy bear lovers, in this category we present all of our products related to bears. 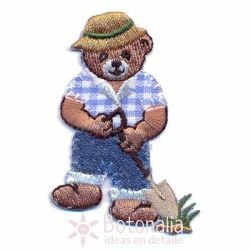 You will find here iron-on stickers for clothing with teddy bears to help you decorate your clothes with your favorite motif. Simple buttons with a bear shape and two holes that can be easily applied to clothing and accessories, as well as fun more complex buttons of various pieces to decorate patchwork and other crafts. Product Description: Decorative button with the shape of a bear. Manufactured by DILL (Ref: 330545). To be used in scrapbooking, card making, crafts, patchwork and general sewing projects.Content: Price is per unit.Length: 26 mm.Material: Plastic. Decorative buttons with the shape of bears with objects and clothing related to the summer and the beach. Perfect for crafts and projects of scrapbooking, cardmaking, patchwork, etc.Content: 5 different buttons.Diameter: 23 to 30 mm approx.Material: Plastic. Decorative buttons with the shape of female bears dressed as fairies. Perfect for crafts and projects of scrapbooking, cardmaking, patchwork, etc.Content: 3 different buttons.Diameter: 27 to 32 mm approx.Material: Plastic. Decorative buttons with the shape of teddy bears. Perfect for crafts and projects of scrapbooking, cardmaking, patchwork, etc. Content: 5 different buttons. Diameter: 25 to 28 mm approx. Material: Plastic. 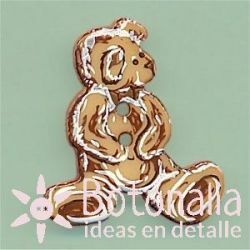 Decorative button with two holes with the shape of a little bear in beige. Perfect for crafts and projects of scrapbooking, cardmaking, patchwork, etc.Diameter: approx. 21 mmContent: The shown price is per unit.Material: Plastic. Decorative button with two holes with the shape of a little bear in hot pink. Perfect for crafts and projects of scrapbooking, cardmaking, patchwork, etc.Diameter: approx. 21 mmContent: The shown price is per unit.Material: Plastic. 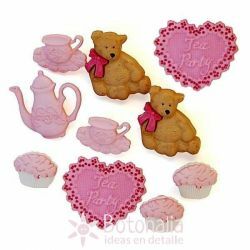 Product Description: Buttons and embellishments with the shape of bears with a ribbon in pink, tea set, cakes and tableclothes with the shape of a heart. Ref. Dress-It-Up: 3161. Suitable for craft and scrapbooking, card making and patchwork projects.Content: 8 buttons and 2 embellishments (the hearts)Diameter: 16 to 26 mm approx.Material: Plastic. Product Description: Decorative button with the shape of a pink bear with a heart.To be used in scrapbooking, card making, crafts, patchwork and general sewing projects. Content: 1 button. Diameter: approx. 30 mm Material: Painted wood.